This picture book of 1000 first words will broaden young children's vocabulary and strengthen their early reading and writing skills. The inviting pages are filled with pictures, word labels, and simple sentences, and topics include Me and My Family, Animals, How We Look and Feel... read full description below. This picture book of 1000 first words will broaden young children's vocabulary and strengthen their early reading and writing skills. The inviting pages are filled with pictures, word labels, and simple sentences, and topics include Me and My Family, Animals, How We Look and Feel, Around the World, I Know Colours, Shapes, and Numbers, and Weather and Seasons. There are also some fun story style pages that tell a simple narrative and inspire storytelling skills: for example, All in a Day is about a young child's typical day, and If I Were a Pet looks at a dog, cat, rabbit, fish, and pony, and imagines what these different animals might like to do.1000 Useful Words clearly labels every picture, which encourages picture-and-word association and helps early reading, and each topic features short sentences for children to finish that reinforce grammar and encourage writing skills. The words have been chosen with the help of a leading educational consultant, Penny Coltman, and include a combination of useful and imaginative nouns, verbs, adjectives, and adverbs. Young children will be amazed and delighted by all the fascinating real-world photos, things to spot, imaginative pictures to talk about, and incredibly useful words! 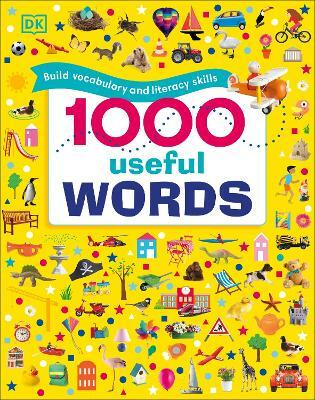 This fun and educational picture word book is a must-have first reference title for parents who are keen to develop their child's language and literacy skills.